Following the writeup everything seemed to be working. I could see the RX led on the Uno flashing as it got data from the BT receiver but the LED stayed off. 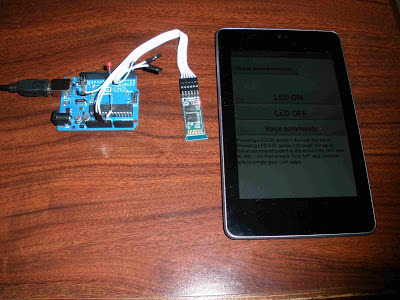 I was intrigued why the writeup said connect the LED to pin 2 of the UNO but defined the LED as pin 7 in the Arduino code listing. I moved the LED to pin 7 and everything worked great. I tried voice commands but as usual the google voice recognition software could not cope!